Today we’re proud to announce six new titles, and two new partners! Our first brand-new announcement comes from our new partner Purple software! Featuring a top-notch voice cast, comes Hapymaher! What is real? What is just a dream? How can you be certain one is not the other? When dreams seem real and reality fades into a dream, where does the truth lie? For Tohru Naitou, a young man forced to experience lucid dreams when he rests, that question is not an easy one. Though his only rest from the nightmare is exhaustion, a girl claims she can put an end to them––but is she real? Or is it all a happy nightmare? 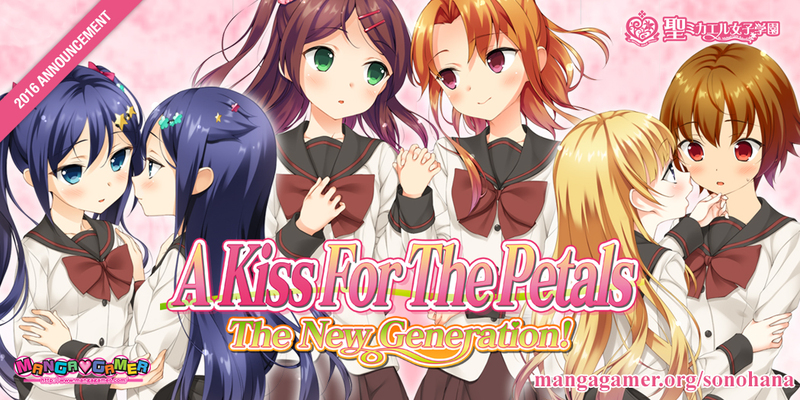 Next, we have more all of our yuri fans–the newest title in the A Kiss For The Petals franchise, The New Generation! Our next announcement comes from our new partner, 3rd Eye! 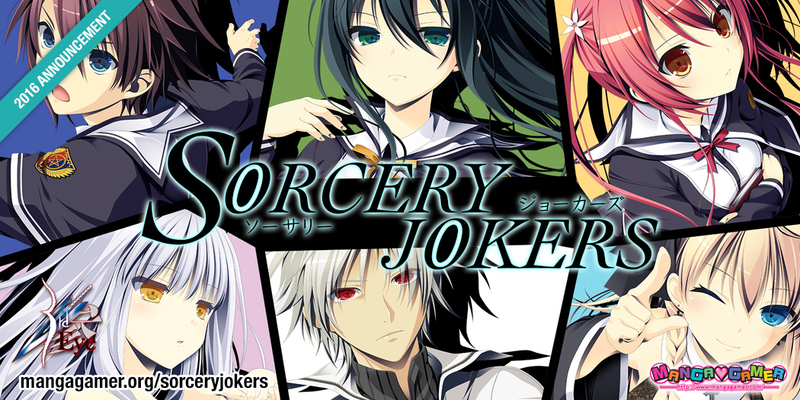 Winner of the 2015 Moe Game Awards for Scenario, Sorcery Jokers will be coming to both MangaGamer and Steam in full HD! Explore this lengthy, battle-action story across six different perspectives, with new scenes and new opportunities opening up as you delve deeper into each character’s life! Of course, we wouldn’t forget our friends at liarsoft either! 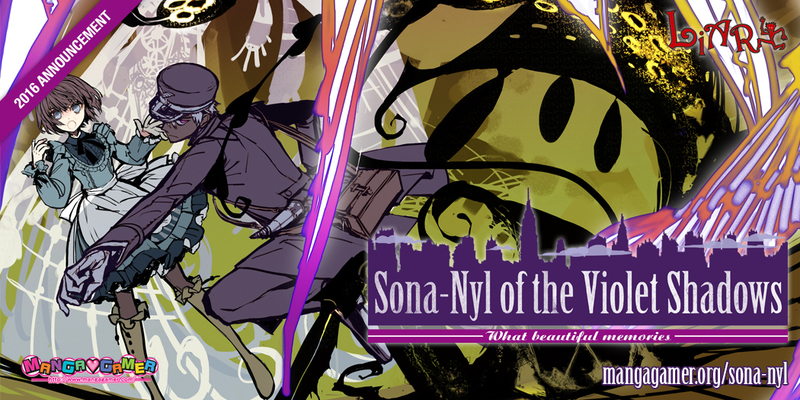 This time we’ll be bringing you Thomas Edison’s tale in the predecessor to Gahkthun of the Golden Lighting––Sona-nyl of the Violet Shadows! and one who finds herself in an underground world with a purple sky, where the “vanished” city still stands. The central focus of the tale is Lily, a girl devoid of memories who sets off through the bizarrely transformed “Underground New York.” Driven by her determination to reach the “ends of the sky,” she travels through this dangerous world accompanied by an enigmatic young man known as A. In the course of her long and difficult journey, they meet many of the city’s inhabitants, and fend off the attacks of strange and terrifying monsters. Our last two announcements both come from our partners, Alicesoft, as well as their infamous Rance series––Rance VI and Rance 5D! 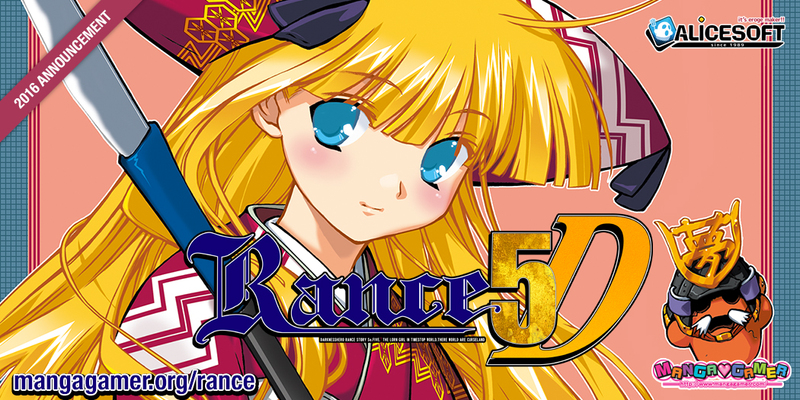 In Rance 5D, a standalone episode in the series, Rance goes adventuring with his slave girl, Sill, and his pet, Athena 2.0, in order to recoup all the money he’s blown! Their travels lead them down a dungeon where they get lost and wander into a mysterious town full of youkai! Together they go dungeon crawling, face dice battles, capture female monsters, recruit and train the monsters they capture, all just to try and get home! There’s loads of gameplay with battles and movement determined by dice rolls, while strategic management of time, skills, and item drops can help affect your odds––no two playthroughs will be the same in Rance 5D! This fun, lighthearted title in the series makes a great intro to Rance before delving into Rance VI! In Rance VI, Rance travels to the magical Kingdom of Zeth with Sill to take a job. However, In Zeth, mages are considered superior and all others treated as second class citizens! Indignant at his imprisonment and the discrimination turned toward him, Rance joins the resistance to lead Zeth to a revolution! 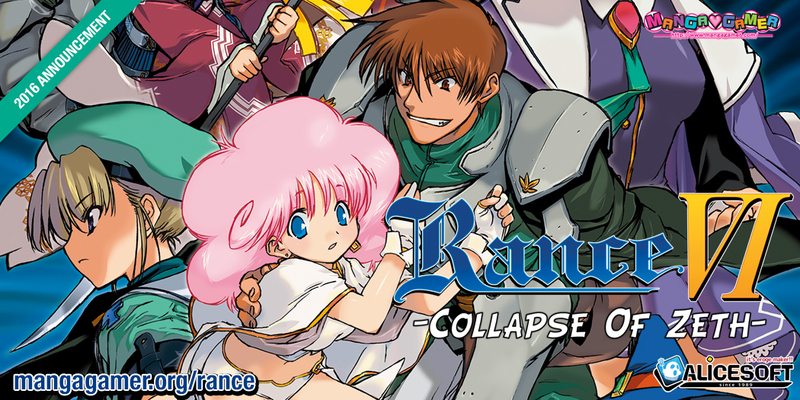 With just cause on his side, Rance sets out to punish the evil mages who scorned him and expand his ever-growing harem! Jam-packed with gameplay, Rance VI is a full 3D Dungeon Crawler, with over thirty dungeons full of different monsters to face and events to trigger! Both Rance 5D and Rance VI will be sold together in a single bundle for $34.95 this winter! Additionally, we’re working to remaster Rance VI with original assets straight from Alicesoft! And that’s a wrap for Otakon! But that’s not the last from us this year––we still have Anime Weekend Atlanta coming up next month. Hope to see you there! You can keep up with all our new acquisitions and our convention schedule on our convention schedule & announcements page. Tagged a kiss for the petals, alicesoft, hapymaher, liarsoft, purple software, rance, rance 5d, rance vi, sona-nyl of the violet shadows, sorcery jokers, st michaels. As long as MG does a Rance title every 2-3 years, I’ll be happy. Preferably 2. Sengoku or 01 should be next. Quest/Magnum after Sengoku and 03 after 01. Perhaps 01 and 02 will be in a bundle while 03 is bundled with the probable 04. Then Rance IX and of course Rance X.
I don’t think they’ll go exactly in release order, but if they do, it’ll be Sengoku, Quest/Magnum, 01, IX, then 03. That would be perfectly fine IMO. It’s not really out of order? 1-4 are freeware and translated, they can’t sell them. 01 is a much a prequel as it is a sequel, it references future games. Selling 03 first is stupid as its the only voiced one. Starting with 5D and 6 makes the most sense. While we’re on the subject of Alicesoft, I have to take this time to beg for Oyako Rankan again as an NTR fan. Or other NTR titles for that matter. Anyway, thanks MG and keep up the awesome work! You continue to prove that you are the best visual novel localization company out there! Not a NTR fan at all but I’m vey interested in Oyako Rankan as well. Yes, please do Oyako Rankan, I have been waiting for it since Beat Blades Haruka got translated. As for me, Oyako Rankan is currently the peak of Min Naraken’s art. If you choose Oyako Rankan, please do it after RanceIX! Damn, you actually patnered up with 3rd Eye! (I actually filled out thei previous game “Gensou no Idea ~Oratorio Phantasm Historia~” on the annual survey but since it didn’t reach the top 10 I totally wasn’t expecting this). I hope the previous title will come over too at one point but this is great news nonetheless (Sorcery Jokers also has a ridiculously high VNDB rating, whoa). Good, I’m glad the reception for Beat Blades Haruka was good enough to warrant a continued relationship with Alicesoft. Winter can’t come soon enough, this is a must buy for me. Nah, Sengoku has to be next for obvious reasons. Anyone who played VI then skipped to Quest because Sengoku wasn’t officially translated would be very confused. I could see them doing 01 before Sengoku or after Quest. Well, they have two translators experienced in the Rance series, so they could do 01 concurrently with either of them. Quest is a little more than halfway translated at least (including Magnum), so it shouldn’t take too long after Sengoku is retranslated. That said, Alicesoft has a lot other games that people want other than Rance, not to mention that Mangagamer has a lot of partners now. I think Quest will still take about 4 years at least. Anyone who’s even remotely interested in Rance series has played Sengoku to hell already. It’d be like officially releasing FSN at this point. Now that you mention it though, I think that it’s a good idea to minimize the gap between Sengoku and Quest. Not sure what a good time gap would be but I would guess somewhere between 6 months and a year. Assuming bad end keeps doing working on the Quest translation occassionally while doing official work, it should be possible, but I may be expecting too much. Outright bundling Sengoku and Quest probably isn’t a good idea since both are full length games (with Quest + Magnum being extra long). Quest also doesn’t have a low price edition (yet). wait there is a translated version of FSN somewhere – I mean I actually wanted them to translate FSN…but for a good translated version of Sengoku I would probably buy it even though I have played it to death just to support as man do I love me some rance (and as good as the unoffical translation was I expect mangagamers woudl be better). Can you guys please consider a partner ship with Empress and license any of their VN like DominancE, closed game and P/A this is the same company to which starless belongs to. Since starless made a killing internationally licensing these games will be quite beneficial to you, so please consider them. Wow, super impressed with Hapymaher and Sorcery Jokers, And jay, my guess with Sorcery Jokers was correct! :-). Didn’t see Hapymaher coming – that really caught me by surprise. Like how you handled the old Rance translations. Would have been a pity if they’ve gone to waste. Though some Rance fan boys might have preferred a newer title instead. Though that could still happen I guess ;-). Still, not really a franchise that interests me personally. Sona-nyl seems to be Sakurai’s best title so Liar-Soft fans will be happy I guess. The New Generation! also seems to be a nice yuri title Sono Hanabira fans will be happy fans. No interest in either of those two titles, but I’m already super happy with Hapymaher and Sorcery Jokers. 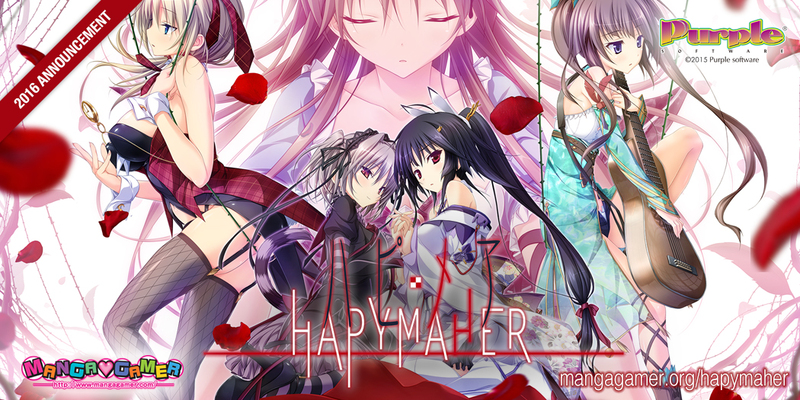 Thank you for snatching away Hapymaher from Sekai Project! This was the second most liked announcement from you guys. The best announcement goes to Rance though! 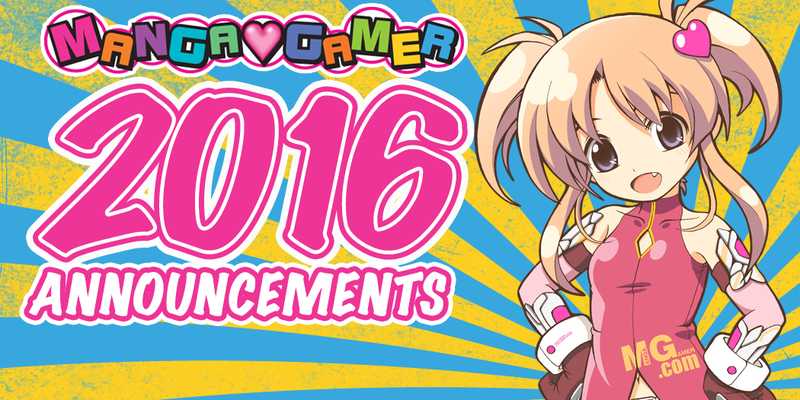 Really glad to hear that news, and can’t wait for Sengoku Rance + Quest/Magnum later down the line. Sona-Nyl was the announcement I was hoping for. Can’t wait, thanks a lot! Are you ever going to get to the Kiss for the Petals games that have fan translations, or should I stop waiting and just play the fan translations? I’ve only played the first two and they were great so I figured I would buy them as you release them but there has been a real lack of old titles. I don’t see a problem here – you can play the fan-translated ones, and buy them once they’re released to show your support. I doubt it, but they might announce something at Atlanta since they save smaller announcements for smaller conventions. I’d go ahead an play them if they don’t announce anything then. I’m interested in most of these, so that’s cool. Will continue to wait for eden* Hardcopy though. Looks promising. Sad VNs of Ricotta dev missed this year again but I hope Romanze Walkure/Princess Lover will be translated in my lifetime… quite a pipe dream I have. I’m looking forward to The New Generation, for Sure. O_O As well as Sona-nyl. Happymaher… Looks interesting, but I would need to see more of it. X_X And I hate Rance, as a person. I look forward to seeing the entire Alicesoft Catalog eventually but…….. please, let’s have Sengoku and Rancequest next. All Hail RANCE! I’m inclined to agree with MG prioritizing Sengoku and Rance Quest. The fanbase has been waiting a long time for the latter. Coincidentally, it’s been 5 years since RQ has been released. I’d understand if MG wants to alternate between Rance and non-Rance and there are a lot of non-Rance Alicesoft games I want. However, Rance is undeniably the flagship series of Alicesoft, and people will complain if MG doesn’t release it fast. I think a lot of those complainers would be a lot calmer after RQ is released. At least then, there would be 2 new full-length Rance games to tide over the wait for Rance IX/01 rather than only having Rance VI to occupy the fan base during the 4 year wait for Quest. I don’t see Quest taking four years unless it takes that long to license it. The game’s actually like 50%+ translated already by one of MG’s own people after all. Once its a proper project it shouldn’t take more then a year or so to finish off. If anything, Sengoku having to be first is what will make it take four years for Quest.